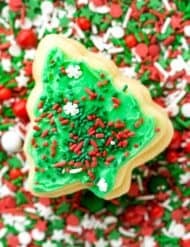 The perfect sugar cookies, every single time! In the bowl of a stand mixer fitted with the paddle attachment, or using a hand mixer, cream the butter and sugar. About 2 minutes. Add eggs and vanilla. Mix until combined. Add the flour and baking powder. Mix until combined. Preheat oven to 350°F. Roll out dough on a lightly floured surface (keep dough about 1/4" thick, or thicker if that's what you prefer). Use cookie cutters to cut into your desired shapes. Place on greased cookie sheet (you can also use parchment paper or a silicon baking mat). Bake at 350°F for 10 minutes. Remove from oven and let cool on pan for 5 minutes. Transfer to a wire rack to cool completely. Frost cookies. In the bowl of a stand mixer fitted with the paddle attachment, or using a hand mixer, cream the cream cheese and butter. About 1 minute. Add the powdered sugar, vanilla, and milk. * Mix until it forms a thick frosting. *You can add more milk to reach your desired consistency.